The United States is the world’s best place to do business. Our country is home to a skilled and productive workforce, unmatched institutions of higher education, strong intellectual property protections, a commitment to innovation, an abundant and stable energy supply, and access to millions of global consumers through high-quality free trade agreements. For these reasons and more, CEOs from around the world have ranked the U.S. as the number one place to invest for three years in a row. In 2015, we welcomed investments from businesses of all sizes, from budding entrepreneurs to major multinationals like Nissan, ABB Group, Novo Nordisk, and Daimler Chrysler. These companies can choose to operate anywhere, but they chose the United States. We remain home to more foreign direct investment (FDI) than any other country in the world. FDI generates growth and creates jobs in many sectors of the American economy, including manufacturing. U.S. manufacturing is in the midst a real comeback, with companies adding nearly 900,000 manufacturing jobs since February 2010 and new factories opening their doors at the fastest rate in decades. Our most recent data demonstrates that foreign investors have played a critical role in this growth. FDI in the U.S. manufacturing sector reached $1.05 trillion (2014) and supports 2.2 million jobs (2012). Furthermore, U.S. affiliates of international companies spend $48 billion annually on research and development, which drives both innovation and exports. On Friday, we celebrated Manufacturing Day, but year-round, this Administration is focused on what it takes to keep American manufacturing strong, to attract job-creating global investment, and to build a competitive 21st century economy. 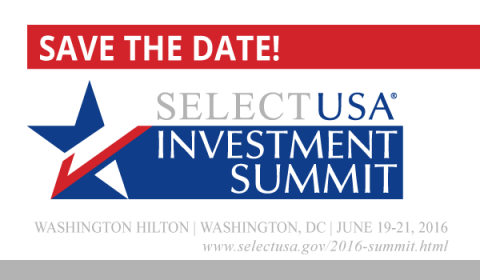 I am excited to announce that the U.S. Department of Commerce will host the third SelectUSA Investment Summit on June 19-21, 2016 at the Washington Hilton in Washington, DC. Established by President Obama in 2011, SelectUSA promotes and facilitates business investment by working with companies that want to establish U.S. operations and by partnering with U.S. economic development organizations to attract them. In the past four years, SelectUSA has assisted in winning over $17 billion of deals across the country. The SelectUSA Investment Summit, the initiative’s showcase event, is the premier venue for international investors of all sizes to find the right place, with the people, resources, and market they need to be successful. At the last Summit, investors from over 70 foreign markets and economic development representatives from all 50 U.S. states joined President Obama, six Cabinet Secretaries, three Governors, and dozens of leading CEOs from major international firms and SMEs to learn more about the U.S. investment climate and opportunities for investment. To learn more, I hope you will consider joining us at the 2016 SelectUSA Investment Summit. Please sign up for the SelectUSA email list by visiting www.SelectUSA.gov, and you will be the first to know when registration goes live.